Just do a quick search for the pirate bay, and you will find their most recent URL. They get shutdown constantly so do not be surprised to see that they have moved to a new domain every few days/weeks/months. Search for something you want to download, in this case we are going to look for a Linux image! There are a few things you need to know about the information listed here. First the two columns on the right side. SE means "seeders". This is the number of people who have 100% of the file stored on their computer and are actively uploading it to the swarm. LE means "leeches". This is the number of people who have <100% of the file and are trying to download it. Traditionally you want to have a high number of seeds and a low number of leeches. If there are zero seeds, no one is uploading the file and you cannot download it. Look at the file names and find the search result which actually matches our search, then click the little picture of the magnet. See the little magnet... that's a magnet link! It is a URL version of a .torrent file! These are much more efficient and secure than an actual torrent file so we try to use them whenever possible. 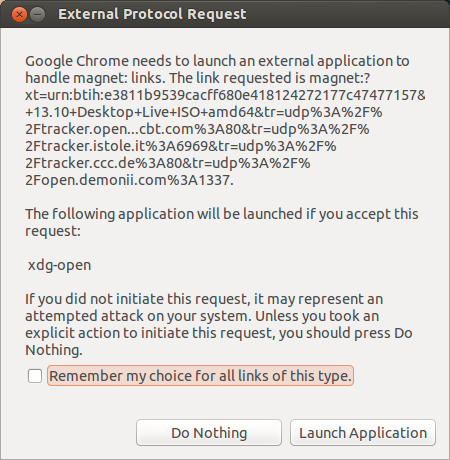 You may be prompted that the link is going to open your torrent client. That's fine. You will see the download appear in your Deluge window like this. The download will appear in your download queue and start searching for files to download! Once the download reaches 100% you can let it seed for a while, since that is the culture of torrents. People who download and run are usually banned from networks. You need to have a very high seed:leech ratio if you want to be allowed onto any private trackers or index sites. Usually 2seeded:1leeched is a minimum requirement to be considered. Once you are ready to remove the download click the red "-" sign at the toolbar and select "Remove Torrent"
Your downloaded file should be located in the "complete" folder you setup earlier in this guide! Congratulations! That's all there is to it!